Diamond CBD Shot 20mg 4-6 Hour of Relaxation is made with cbd oil. 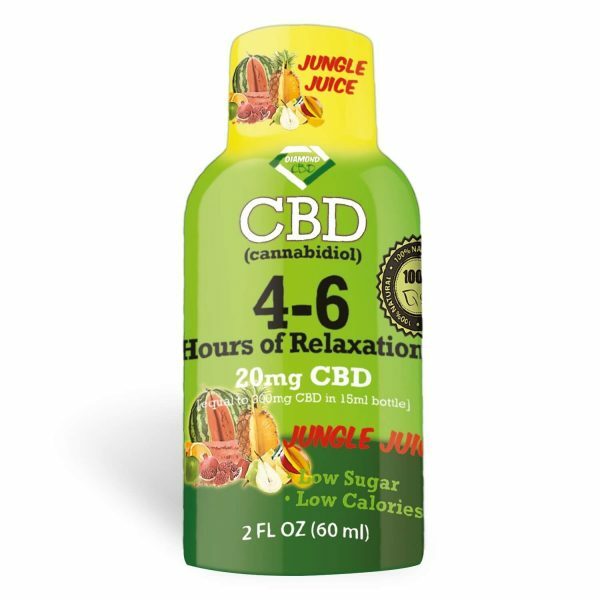 4-6 Hours of Relaxation Diamond CBD Shot 20mg Jungle Juice [single] is made from industrial CBD hemp oil (cannabidiol). Free of THC, this CBD Shot is a CBD alternative to CBD tinctures or CBD pills. Buy product 4-6 Hours of Relaxation Diamond CBD Shot 20mg Jungle Juice [single] that is made from industrial CBD hemp oil (cannabidiol). Free of THC, as a result, this Diamond CBD Shot 20mg is a CBD alternative to CBD tinctures or CBD pills. Let’s face it. With our hectic lifestyles, sometimes there is nowhere to hide from the stress and anxiety of today's life. Perfect anytime, anywhere you need relaxation, 4-6 Hours of Relaxation Diamond CBD Shot 20mg lets you feel the wonderful effects of our CBD Drink quickly. Take this handy little 2 oz bottle with you anytime and anywhere you feel the need to relax. For best results, shake well and serve chilled. 4-6 Hours of Relaxation Diamond CBD Shot 20mg CBD Drinks will have you completely relaxed for hours. Royale Hemp is your go-to place when it comes to high-quality, pure CBD oil, Concentrates, Edibles, including CBD Drinks and more. As a result, you will be getting quality CBD products when you make your purchase on our website. Get your preferred CBD oil products for personal use or as a gift to a friend or a loved one here. To let our customers know we make commissions based on sales but you can be sure that you’ll be getting your money’s worth with our original CBD products. Buy now and experience the many health benefits of CBD Drinks today. And always thank you for visiting or shopping at Royale Hemp.